The actor most famous for playing the rebooted Captain Kirk is due to play yet another charismatic leader. 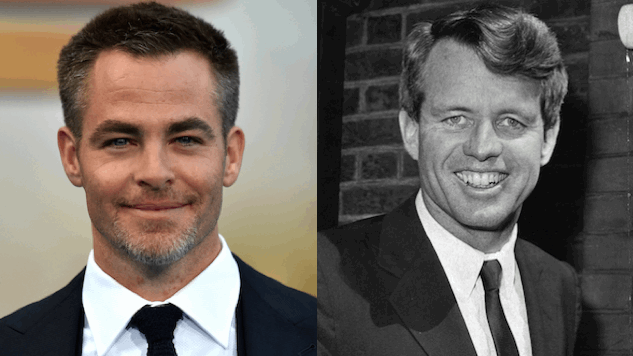 After Hulu found success with its original series 11.22.63 (based on the Stephen King novel of the same name), the online streaming service is doubling down on the Kennedys with a Chris Pine-starring Robert Kennedy project (via Deadline). The limited series will be helmed by writer Todd E. Kessler (The Good Wife), who will adapt the biography Bobby Kennedy: The Making Of A Liberal Icon by Larry Tye. Tye is attached to the show as an executive producer, as are Kessler and Pine. The 2016 biography depicted RFK as “bare-knuckle operative, cynical White House insider and romantic visionary,” based off of extensive research from hundreds of interviews and unpublished memoirs. Pine is coming off a summer hit in Wonder Woman, co-starring with Gal Gadot. Pine will be seen in Ava DuVernay’s adaptation of A Wrinkle in Time. No release window has been announced yet for the RFK limited series, so that will give Pine some more time to practice his Boston accent.